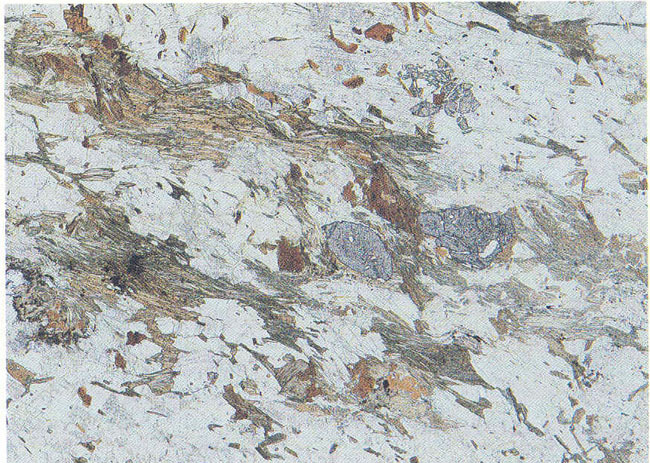 Ok, so now we want to make a garnet schist from our mud–I’m assuming this is a garnet-muscovite-biotite paraschist, since that’s what most people envision when they think garnet schist. (I’m actually going to take this one step further and go all the way to a migmatite.) Remember, we’re starting with a water-rich, Si + Al-rich protolith that has some Fe2+, Ca2+, Mg2+, Na+, and K+ as well. 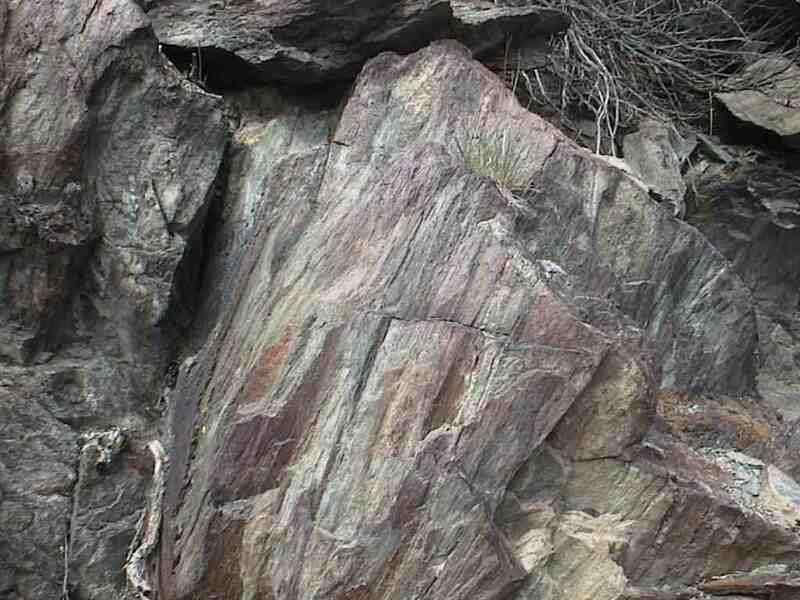 In order to get a schist, we need to have foliated rocks, which are due to a differential pressure. The most common cause of differential pressure is orogenesis or a mountain-building event. 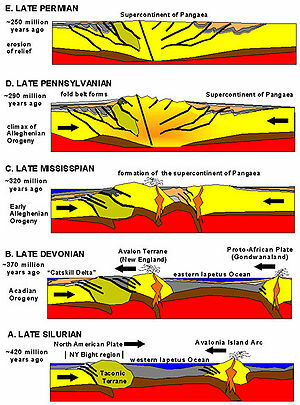 An orogeny occurs when plate tectonics cause the collision of 2+ plates. The rocks caught in the middle become squished and heated transforming from shales into a variety of foliated metamorphic rocks. Almost all mountain belts in the world are due to orogenesis and most are composed of a mix of foliated metamorphic rocks, intrusive igneous rocks with associated contact metamorphic aureoles, extrusive igneous rocks, and a mix of sedimentary rocks from non-calm environments. The mud to shale transformation will be the same, so we’re start with the shale. This time we’re going to force the rock to undergo a differential stress (stress is simply pressure over a specific a specific area) concurrent with increasing the temperature. 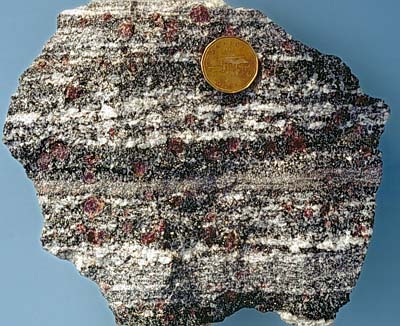 Because of the differential stress, the existent minerals either rotate or grow parallel to the minimum stress direction. At relatively low temperatures, the rock will become a slate. 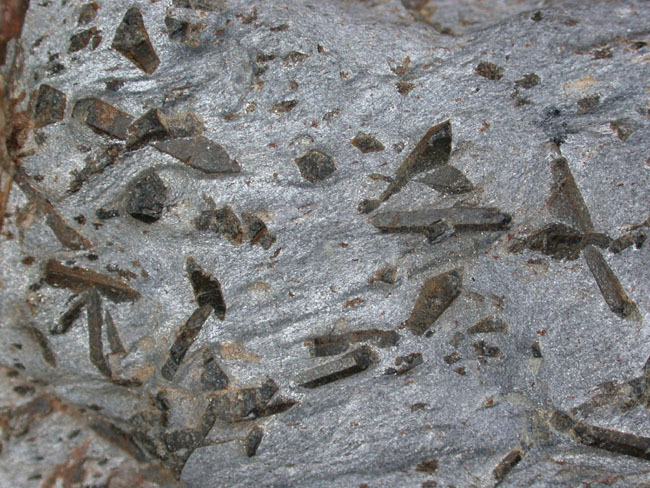 Though harder & able to break more easily than shale, slates are still very, very fine grained so that individual grains of are not visible to the naked eye. As the temperature increases, more water is driven off. Muscovite – KAl2(AlSi3O10)(F,OH)2 & chlorite – (Mg,Fe)3(Si,Al)4O10(OH)2·(Mg,Fe)3(OH)6 (both are micas) are now stable & start to grow large enough to be seen with the naked eye. 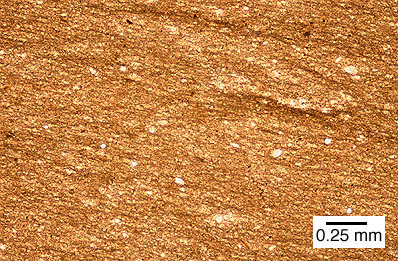 Quartz & plagioclase (NaAlSi3O8 – CaAl2Si2O8) are also stable, but difficult to see with the naked eye. The new rock is called a phyllite, which will not break along planes that are as smooth as the slate. As we continue to heat the rock, the amount of micas in the rock decreases as we drive off more water & the percent of anhydrous minerals increases. 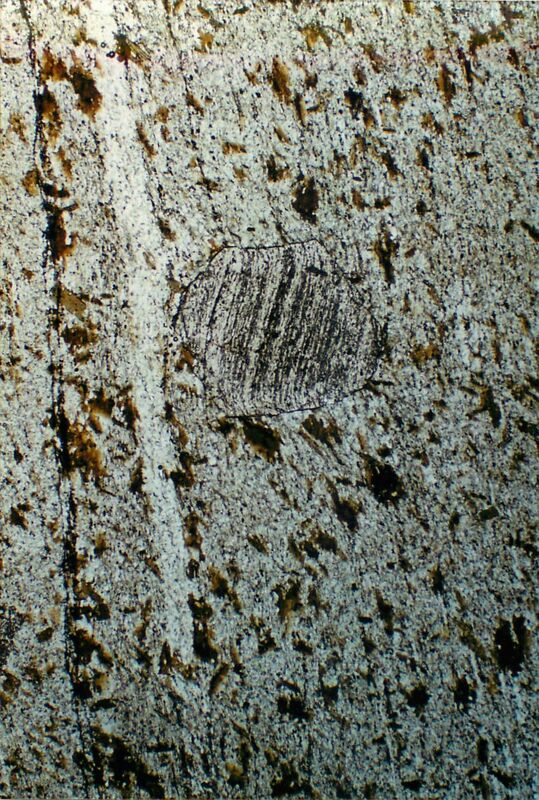 From garnet, we cross into staurolite ((Fe2+,Mg,Zn)1.5-2Al9[O6|(OH,O)2|(SiO4)4]) schist for a short period of time. Though staurolite is hydrous, the amount of water needed for it is much less than the micas. As staurolite starts to break down, we’ve reached another critical point. Our rocks are going to shift from containing a reasonable amount of micas to being comprised of a high percentage of anhydrous minerals. One result of this shift is that we’re going to move away from schists that are mainly due to the alignment of platy micas and instead form gneisses. 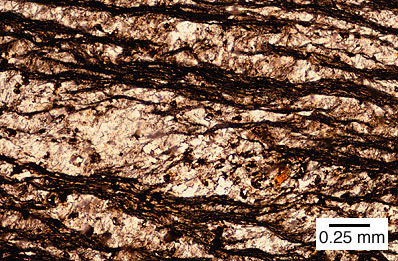 A “gneissic” texture simply means that the minerals are banded with darker colored minerals (biotite, amphibole) together & lighter colored minerals (e.g. quartz, plagioclase) separated from each other. 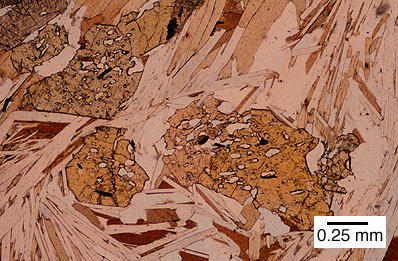 As first muscovite then biotite breaks down, the rock can take two different paths. 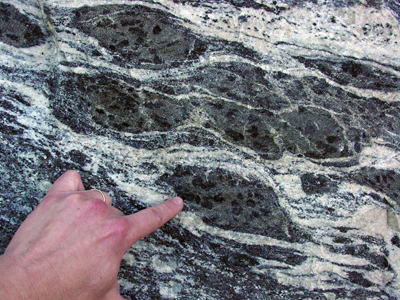 If the reaction occurs slowly and water just trickles into the system, the gneiss will simply become more & more anhydrous in a solid state until the granitoid-melting temperature is reached. 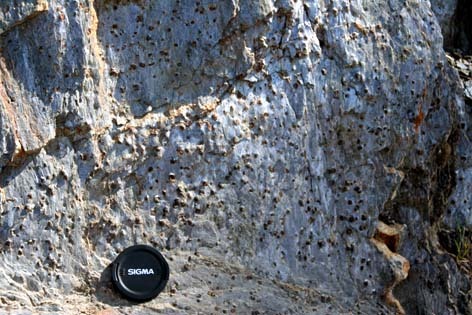 Ok, so that’s mud -> migmatite. 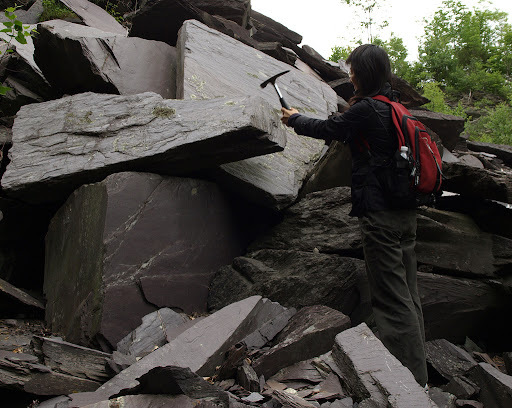 Boy is this post overly long even after separating it into three posts–if anyone is still there & wants me to go through the metamorphism of a basalt, limestone, some other protolith of your choice, please just leave a comment.